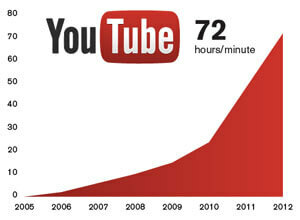 Home » Future Trends Blog » You Tube’s Exponential Growth! 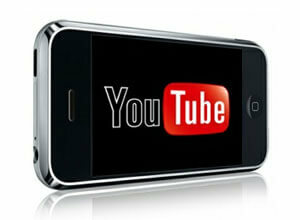 YouTube is growing exponentially thanks in part to mobile access. It goes without saying that YouTube has become the quintessential online video source for amateurs and professionals alike, but on the service’s seven-year anniversary, Google made quite a startling announcement: 72 hours of video are uploaded every single minute. That’s three entire days worth of cat videos, webcam rants, conference proceedings, news interviews, and company marketing fodder that is quietly swelling hard drives that already serve up four billion videos a day. According to the YouTube statistics page (which still needs to be updated with the latest numbers), more video is uploaded in one month that the three major networks in the US have generated in 60 years and over 3 billion hours of video is watched per month. Yikes! However, the biggest surprise of all is that YouTube, which was founded in 2005, is not only growing, but it’s growing exponentially. With the ease of access the Internet provides and the growing number of people gaining access through mobile devices, media is clearly accelerating, but just how fast is fast? A growth chart to the right from Forbes makes it quite clear that uploads are going exponential. This is likely fueled by mobile access, which gets over 600 million views a day and tripled in 2011. YouTube has become part of the culture to the extent that both national and local news routinely pull videos from it for segments instead of producing their own. There’s so much video that for April Fool’s 2012, the site jokingly advertized the option to buy the entire “YouTube Collection” video library on DVD, which would come out to be 555,000 discs. But it’s hard to say whether this amazing growth trend can continue or whether it will eventually flatten out. Considering that Google has invested $200 million to partner with select media groups to create specialized channels, priming YouTube into a more robust competitor to television, and positioning itself along with Netflix and Hulu to encourage people to ditch their cable for good. Of course, with every video comes the opportunity for Google’s AdSense to bring in the advertising dollars, and companies like Vevo introducing much maligned commercials before music videos. YouTube has also started expanding merchandise opportunities to all of its partners using CafePress, which is yet another avenue for it to monetize its free video offerings.